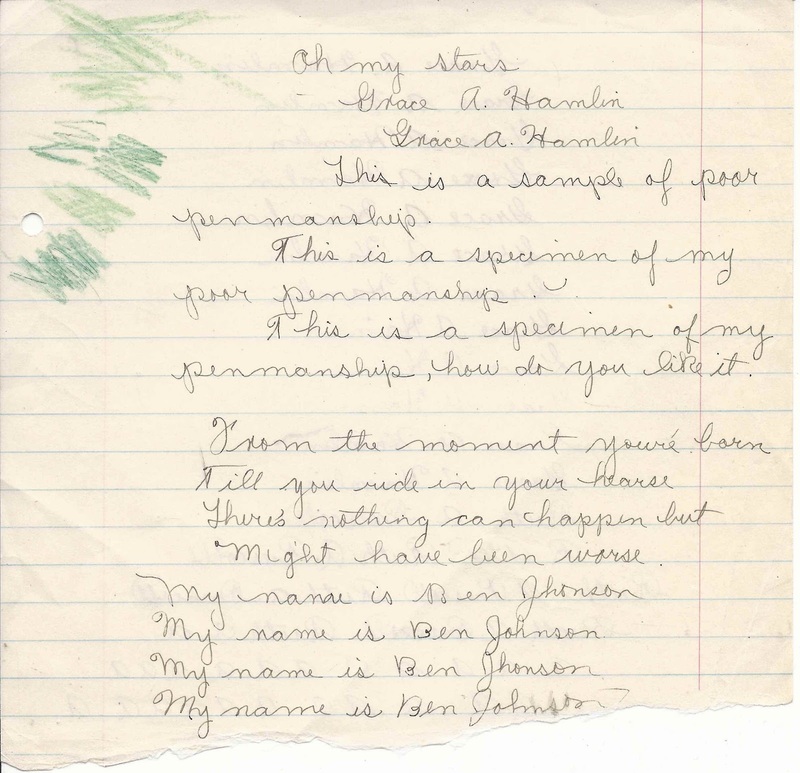 Penmanship practice paper of Grace A. Hamlin. 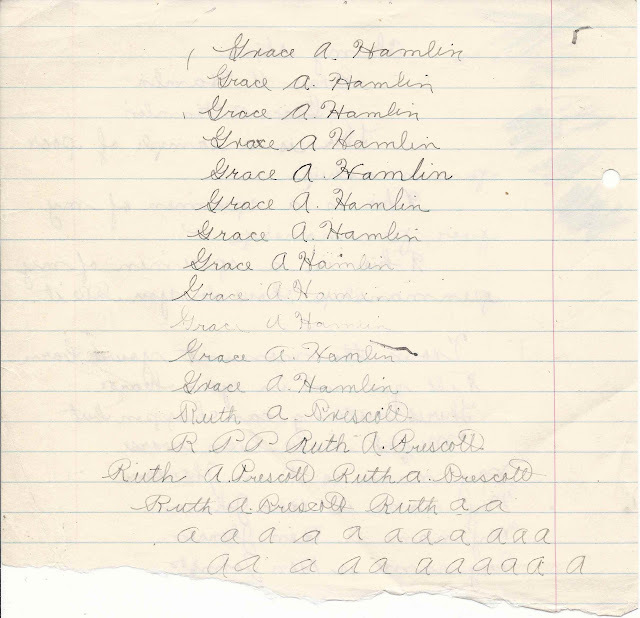 Grace mentioned Ruth A. Prescott in her practice lines, and the fact that Brownville also had a student named Ruth A. Prescott, born about the same time as Grace, makes me fairly confident that Grace A. Hamlin was a student at Brownville, Maine. Grace Abbie Hamlin was born 14 March 1909 at Brownville, Maine, daughter of Melvin Augustus Hamlin and wife Ethel Albertina (Bell) Hamlin, born at Barnard, Maine, and Moro, Maine, respectively. Grace's paternal grandparents were Eben G. and Susan or Susannah (Ladd) Hamlin of Piscataquis County, Maine. Her maternal grandparents were Richard and Abbie Bell of Aroostook County. If you have information on Richard Bell and wife Abbie (?) Bell, I hope that you will leave a comment or contact me directly. In some sources, Richard and Abbie give their place of birth as Canada. On Ethel Albertina Bell's marriage record, however, it's noted that Richard was born at Blaine, Maine, and Abbie at Stoneham, Maine. I believe that Richard's parents were John and Eliza (Ranke) Bell of New Brunswick, who were early settlers at Blaine, Maine. 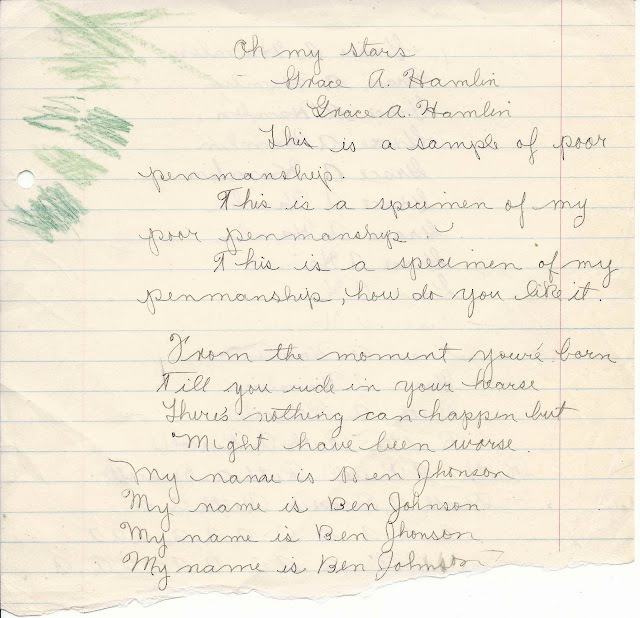 As for Abbie, I know that a John Bell from Stoneham, Maine settled in the Oakfield hills area of Aroostook County. Whether the two Bell families were related, I don't know. The 1870 Census of Oakfield has an Abby Bell, age 14, living in the household of John and Viana, Bell, ages 70 and 65. If this is our Abbie, perhaps she was their granddaughter. given up the management of the farm to his son-in-law, Mr.
the war and all three came home uninjured. 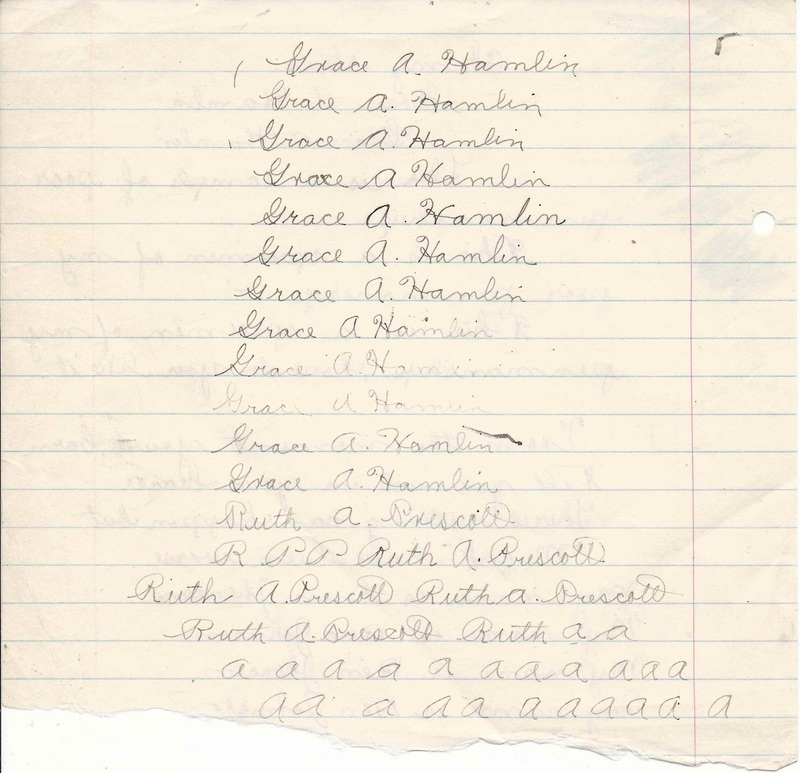 In 1936, Grace Abbie Hamlin married Eugene Swain of White Plains, New York, and raised a family of, I believe, four children. If you have any corrections to the information provided above, please leave a comment.